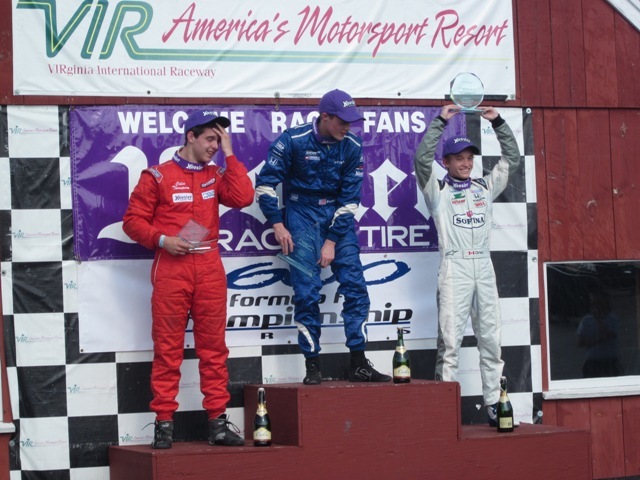 Strong fields featuring several potential stars of the future grabbed the headlines April 14-15 as the F1600 Formula F Championship Series kicked off its 2012 season at Virginia International Raceway. The doubleheader race weekend featured a pair of thrilling finishes, including a four-abreast charge to the checkers on Saturday and a battle between young teammates on Sunday decided by just hundredths of a second. Nearly a third of the 20-car starting field was made up of drivers under the age of 18, including a half-dozen karting graduates from the United States, Canada, Finland and Brazil. In Saturday’s season-opening race, Finland’s Matias Koykka gave the Australian-built Spectrum-Honda it’s first US Formula F victory, prevailing in a four-wide charge to the finish line. Driving for Cape Motorsports with Wayne Taylor Racing, the 17-year-old karting graduate just edged second-year F1600 race Colin Thompson. With the 18-year-old Thompson in a Swift-Honda, Brandon Newey made it three different Honda-powered chassis in the top three positions as he rounded out the podium in his Bryan Herta Autosport Mygale, just ahead of teammate and Canadian FF graduate Garett Grist. Just 0.87 seconds covered the first four finishers. The excitement continued in Sunday’s race 2, as Newey scored his first win, and the first American victory for the Mygale-Honda combination, after edging out teammate Grist by just 0.021 in another side-by-side finish. Thompson rounded out the podium in third in an impressive charge through the field after an early-race spin. Joe Colasacco finished fourth in his Van Diemen-Honda, while for the second consecutive day veteran FF racer Art Foster led the Ford-powered field across the finish, in fifth with his Van Diemen. He finished sixth in Saturday’s opening race. The introduction of the Honda L15A7 engine into Formula F has induced karters to move up and challenge themselves in automotive competition. The engine’s relatively low per-mile running costs have made car racing more affordable than ever before. This past weekend, the Honda Fit-based Formula F engine was found in six different chassis, ranging from the new Spectrum and Mygales to the popular Swift and Van Diemen. Even Andy Brumbaugh’s 30-year-old Crossle 35F was converted from Ford to Honda power for the 2012 season. The 10-race, eastern U.S.-based F1600 Formula F Championship Series continues with Rounds 3-4 at the historic Lime Rock Park circuit on May 24-26. On the west coast, the Corsa Car Care presents Pacific Formula F Super Series continues with its second double-header race weekend of 2012 April 26-29 at Miller Motorsports Park in Utah. Dave King served American Honda Power Equipment in several capacities during his 29 year tenure with the company; District Sales Manager, Regional Sales Manager, Sr. Engine DSM and Sr. OEM Rep. Dave shared a long relationship with Quarter Midgets of America, working with every tech director elected in QMA since 1994 and attending most, if not all of the Grand Nationals since Honda was introduced as a QMA engine. Dave believed in quarter midget racing and supported the sport through his time and efforts over the last 17 years. 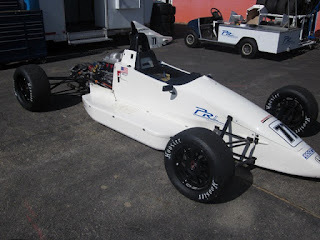 Dave was instrumental in helping HPD bring the Honda Racing spirit to Quarter Midget racing. Dave was looking forward to his pending retirement next month. Dave was a great asset to American Honda Motors and will be dearly missed. Our thoughts are with his family and friends. 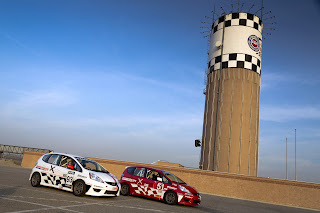 THR-W drivers Sage Marie and Lee Niffenegger kicked off their 2012 SCCA national season with a 1-2 finish in a pair of identical Honda Racing/HPD BFGoodrich Honda Fit machines prepared for the new B-Spec class. Additionally, THR-W drivers Calvin Liu and Derek Ferretti started the season strong with a 1-2 finish in the same cars at a regional race held the same weekend. 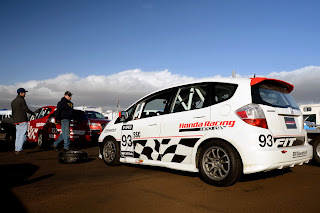 Notably, these events coincided with the sales launch of the HPD-developed B-Spec kit, now available through the Honda Racing Line. Heavy rain during Saturday’s qualifying sessions gave the nimble and forgiving B-Spec Honda Fits a distinct advantage, allowing all four drivers to qualify ahead of some much faster Corvettes that shared their competition groups. “I think these cars are every bit as fun in the wet as they are in the dry,” commented Liu, “Maybe more.” Ultimately, Liu would post the fastest time in regional qualifying, while Niffenegger would post the fastest time in national qualifying. Ferretti was able to stay within several seconds of Liu through the entire regional event and eventually placed second to Liu after both drivers encountered fierce battles with other cars in their run group. The national race was characterized by dry, clear conditions and a close nose-to-tail battle between Marie and Niffenegger. Marie was able to squeak by Niffenegger through use of the draft, but Niffenegger remained glued to his bumper. Ultimately a passing Corvette in a tight section of the track mixed things up enough to create a small gap. With such closely matched cars at a fast track like Fontana, passing becomes virtually impossible without benefit of the draft, and Marie maintained his position for the win. The 2012 Corsa Car Care presents Pacific Formula F Super Series opened its season with a doubleheader race weekend at Willow Springs Raceway north of Los Angeles, with series newcomer Conner Ford and veteran West Coast FF racer Ed Erlandson each claiming a victory. The five-car Formula F field was an encouraging start for the 10-race 2012 season, and included two Honda-powered entries, the Mygale Honda for Ford, fielded by PR1 Racing, and the Piper Honda entered and driven by Mike Simpson. In Saturday’s opening round, Ford’s near-record lap was more than enough to claim the pole, with Erlandson starting on the outside of the front row. Simpson qualified third, as the oval-track Midget veteran adapted himself to his just-acquired, Honda-powered Piper DF5. Ford was unchallenged in Race 1, as he steadily pulled away from the field to a six-second victory over Erlandson’s Swift DB-6 Ford. Simpson followed in third. 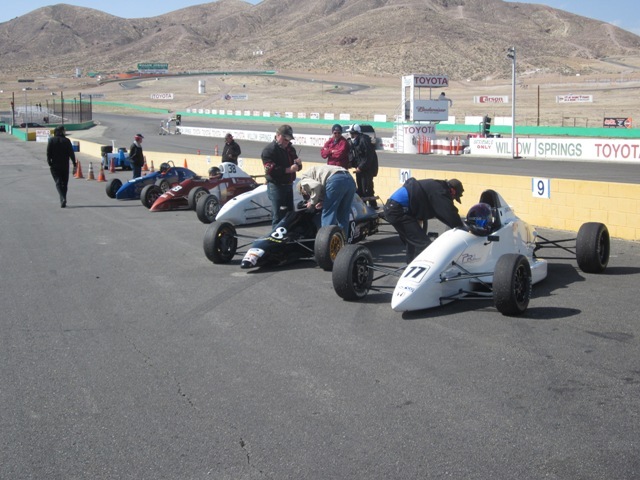 As often happens in the California high desert, the weather changed overnight, and the Formula F field was greeted by much cooler temperatures and higher winds, gusting up to 30-40 mph, for Sunday morning’s qualifying session. However, the top three were unchanged from the previous day, with Ford claiming his second pole of the weekend, followed by Erlandson and Simpson. The winds calmed down substantially for the race, leading to an action-filled event. Once again, Ford took the lead at the start, while Simpson jumped ahead of Erlandson, giving Honda the top two positions early. But on Goodyear tires, Erlandson was not to be denied, as the veteran hauled in the Hoosier-shod cars of both Simpson and Ford to claim his first victory of 2012. Ford held on for second, with Simpson rounding out the top three for the second time during the weekend. Next up for the Corsa Car Care presents Pacific Formula F Super Series is the April 26-29 doubleheader weekend at Miller Motorsports Park in Utah. More information on this series is available at www.pacificF2000.com. 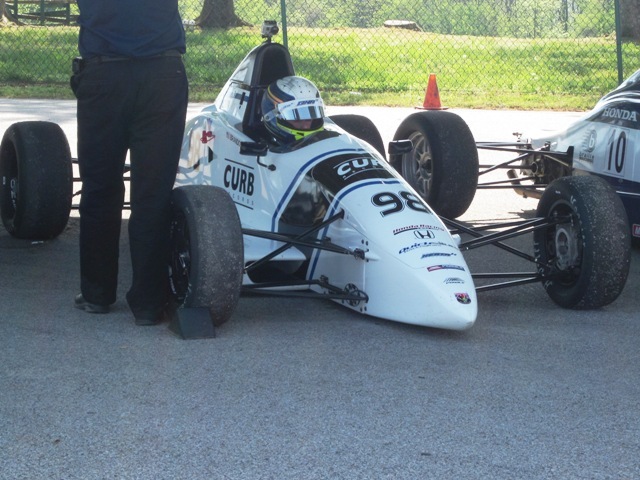 Meanwhile, the eastern U.S.-based F1600 Formula F Championship Series starts its own 10-race season April 12-15 at VIRginia International Raceway. Honda Performance Development (HPD) will support the 2012 Canadian Touring Car Championship (CTCC) with contingency offerings in the Super and Touring classes, as well as the new B-Spec category. Contingency monies will will be paid to first- through third-place finishers who campaign a Honda or Acura in the Super or Touring classes, or a Honda Fit in the B-Spec class, during the 2012 CTCC season. Additionally, HPD will reward championship-winning drivers in all classes during the 2012 CTCC season. "Honda and Acura models have been well-represented in CTCC since our first event six years ago," noted John Bondar, President of Canadian Touring Car Championship. "They have been Champions in both Super Class and Touring Class, and I look forward to their challenge for supremacy in the B-Spec Class." “Honda is proud to make fun cars that people really enjoy,” said Marc Sours, general manager of HPD. "Racing has always been very popular in Canada, and HPD is pleased to be a part of the exciting Canadian racing community." All 2012 HPD CTCC Contingency Program award recipients will be able to use their parts credits toward Honda Racing Line purchases.